Are you looking for high quality adaptive utensils for the elderly? Do you suffer from arthritic hands or tremors that are consistently ruining your dining experience? Have your family members been subjected to grasping difficulties or needed help stabilizing their tremulous hands due to Parkinson's Disease or other neurological disorders? 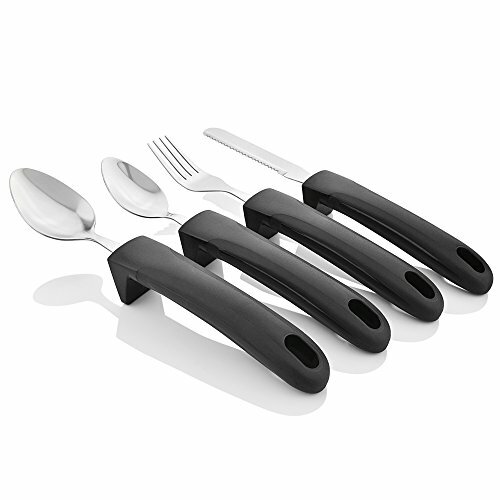 Introducing the Adaptive Eating Utensils by Celley - an innovative (4) piece set of weighted utensils featuring an ergonomic, stainless steel and smooth black design. Each stainless steel utensil comes equipped with a weighted (3oz), adult-sized easy grip handle made of premium rubber - designed for durability and a dishwasher safe application. Not only are these styled to shape to your fingers for a more stabilized, wide & textured grip, but they are sculpted with built-in stands to make it easier to pick up when you are ready to use. Fun Fact: Many users believe the true beauty to be displayed in the low profile, midnight black handles that inconspicuously blend in to any table setting. Whether eating breakfast, lunch, dinner or dessert - make eating a manageable and pleasurable experience once again with the Celley Adaptive Eating Utensils Set. If you have any questions about this product by Celley, contact us by completing and submitting the form below. If you are looking for a specif part number, please include it with your message.